Last month we published an article focused on Facebook shares. Because you enjoyed it, now we have prepared an article about Facebook’s rival in the industry, Twitter. I hope you will enjoy it too. Twitter is a popular social network. It is popular primarily in the USA. Twitter makes it possible for the users to create and read posts (similarly to Facebook) restricting the length of messages to 140 characters. Twitter users do not have too much space to waste but, paradoxically, this is Twitter’s top benefit. Is it also a benefit in terms of their share prices? More than 300 million users find the aggressiveness and conciseness the key qualities in communication. Until recently this was appreciated also by investors. Right now, Twitter is in a small crisis and, as you know, this is the right time to buy. 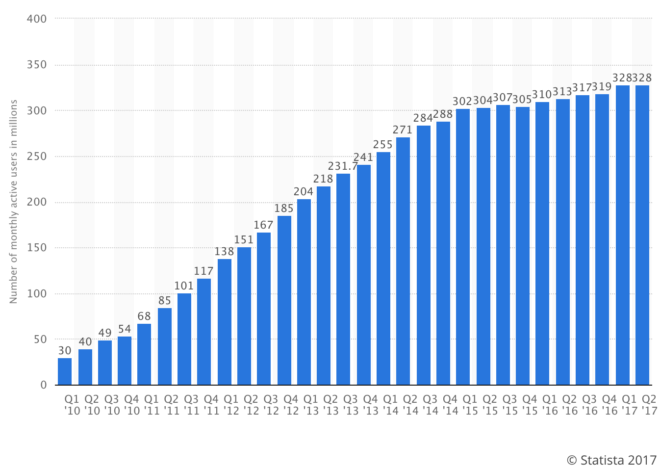 In early 2010 Twitter’s user base was 30 million. Exactly five years later it was 300 million users. This figure did not continue to grow any more. There were some periods in which the number of users even fell. It may seem that the hay days are over but it might be the opposite. There is one more notable milestone in Twitter’s history: debut on a stock exchange, which took place in November 2013 The initial offering of 26 dollars per share immediately grew to 48 dollars per share. Oddly enough, Twitter did not enter the technological NASDAQ but NYSE (New York Stock Exchange). Twitter announced its IPO (initial public offering) symbolically – by posting a tweet! Number of Twitter users has not been growing much lately. The issued value of 26 dollar per share grew to USD 48 to retain this level for some time. At the break of 2014, it even increased to the level of nearly USD 70 per share.. Throughout 2014, the growth slowed down and, as mentioned above, since 2015 the total user base have been stagnating with some minor decreases. This was logically reflected in the financial news. The estimated growth of the first years vanished and the price fell. It fell as low as 14 dollar per share. Currently, it oscillates around 17 dollar per share. At first sight it seems that the price of Twitter shares is fairly volatile. In reality, it is not true. Trends of Twitter shares are clear. Nevertheless, you should anticipate that the price may change. 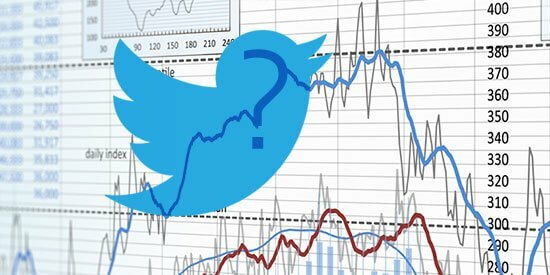 The bullish mood following the IPO faded in the face of hard data (…the price of Twitter shares has much to do with the number of its users) showing that the situation was not as rosy as expected. 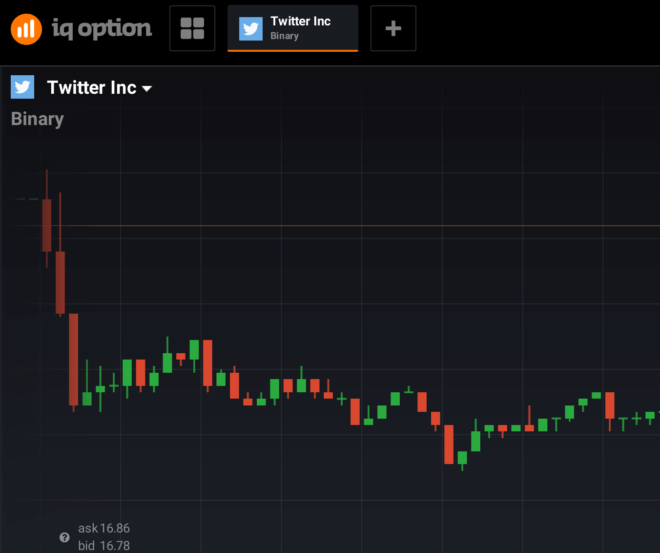 After the decline, the price of Twitter shares stabilised. We can see even some growth potential. As you obviously know in the wake of a fall one should buy (…unlike what most people who sell). This might be a good strategy with Twitter too, you may think, or isn’t it too risky? When speculating on the growth the risk always exists. Most of the risk, however, can be eliminated by binary options trading. With binary options you always know what your risk or loss is. Hence, you can better manage these risks and avoid breaking all your trading account in a single transaction. As opposed to forex your trading account cannot sink below zero. Binary options trading is not only safer but also easier. To find a trading strategy for binary options and to open an account with a broker for example IQ Option, is a matter of minutes. Open your account with IQ Option right now! FREE DEMO ACCOUNT $ 10 Up to 91 %* Review Trade Now!